A community of exploration and education for the spiritual and the religious. I rise today – on the Summer Solstice – as Father Sun (Father/Son) ready to reclaim my place on the cosmic throne. On this, the longest day of the year, I will burn away all that no longer serves me. I will give my light, love and life to the world. I will hold the most beauty, the most justice and the most truth for the most people. I will allow myself to shine brighter than ever. I will plant the seeds of biophilia* (the love of life) wherever I go. I will tend to them and watch them grow. I love. I live. I am. The religions of the world aren’t pieces of a puzzle (with convenient edges and borders) or paths up a mountain to Universal Oneness – they are made of many threads and processes (rooted in language, culture, mythology, consciousness, and more) that create an integral and ever-evolving tapestry. “A Brilliant Matrix: How Religion is Evolving” (presented by Oracle Institute) is an exploration of the stages of consciousness (how we grow up) and states of awareness (how we wake up) and a study of how religion is evolving in our time. Based on the work of philosopher Ken Wilber and using Don Beck’s developmental model of Spiral Dynamics, we will discuss the “Spectrum of Consciousness” present in the world’s faith traditions and consider the truth found in all worldviews. Watch the FULL WEBINAR REPLAY below. It is our mission to deepen personal transformative practice, engage in community service and increase religious literacy. We embrace both wisdom and knowledge by including the beauty, goodness and truth found in the world’s myths, creation stories and faith traditions as well as scientific findings from the domains of psychology, biology and cosmology. We are interested in carrying forward what works about religion and jettisoning what doesn’t. We bring religion into the 21st century by replacing hierarchy with holarchy and practicing religion in a post-modern, peer-to-peer setting. We are reclaiming previously stigmatized words like “church” and “religion” for those raised on pluralistic beliefs, multiculturalism and universal values (i.e. compassion, charity, playfulness, mindfulness and The Golden Rule). We express the three faces (or dimensions) of Spirit-in-Action (“I,” “we” and “it”) as we embody these values in our selves, express them throughout our culture and honor them in nature. We are building radically inclusive forms of spiritual expression including new inter-generational rituals and rites of passage for young people and families, interfaith services and study groups. We also believe in recognizing the new mythologies and sacred texts being written in our time (Star Wars, Harry Potter, etc.). Integral Spirituality is not just a spirituality of “both/and” (masculine and feminine, transcendent and immanent, etc. ), it is the belief that we all transcend and include. The belief that something can be both changing and complete — unfolding, yet ever-present — this is the unique idea that Integral Spirituality offers to the world. This is the vision we hold for the future and the challenge that all religions should take up for themselves. Is Run the Jewels More Christian Than Toby Keith? Run the Jewels. Photo by Tracy May. I’ve often heard folks say that rap music is somehow un-Christian or dangerous. But that hasn’t been my experience in twenty-five years of listening to it. Instead, like every other kind of music that I’ve earnestly explored, I’ve found some true poetry scattered among a lot of forgettable efforts. And I’ve also found some of the finest creative expression that human artists can muster, springing from their own unique, historically-grounded, and God-given perspectives. As art, rap is often pure fiction. Yet, those who attack it argue that rap is intended to literally encourage sin when it speaks to street-reality, violence, drugs, sexuality, and materialism. There are plenty of rap songs like that, to be sure. (Here is the most offensive example I can recall personally; caution, not only are these lyrics inappropriate for children, but if you’re a self-respecting adult, you may be sorry you heard them). But, to be fair, there are also plenty of songs by loudly self-proclaiming Christians whose lyrics seem equally repugnant to Christ’s Good News. And many of them sound to me like they’re intended to be much more literal and realistic than your typical rap. Test yourself on this. Which of the following is Toby Keith, and which is Jesus? From his origins in the Wisconsin heartland to his European awakening and from his nature-based brand of mysticism to his eventual split with the patriarchal church of the day, I have consistently felt a deep connection with the life and work of author, theologian and priest Matthew Fox. I have cited and referenced Fox’s work repeatedly — from my Spring Equinox service to my Thanksgiving Prayer — and consider him to be a primary influence in my practice of entering into a direct relationship with God (not a God that is anthropomorphic or made in man’s image, but God as the Cosmos itself). And as a fellow author and minister, I consider him to be a mentor and spiritual director — an inspiration as I struggle to find a voice of my own and to have that voice connect with a new audience. The rites of passage that I lead for new fathers in our community are directly fueled by his call for ritual and reclamation in books like The Hidden Spirituality of Men: Ten Metaphors to Awaken the Sacred Masculine. I first met Fox at a workshop in Sarasota, FL where he preached about Creation Spirituality, Deep Ecumenism (interfaith dialogue and pluralism), spiritual activism and the importance of grieving in our culture. He described a grieving ritual of his own design and demonstrated the process which asked participants to get on all fours and moan until they were emptied of their suffering. I immediately put this process to the test with the chaplains group I belonged to at the time and experienced deep and profound effects. Just two guys from Wisconsin: The author and Matthew Fox at the Parliament of the World’s Religions, 2015. Fox doesn’t simply want to reinvent worship. He will not be satisfied until the worlds of work and education have been re-booted as well. I recently attended a covenant group at a local Unitarian Universalist church. It was a group for parents and as is the case with groups of this kind, was accepting new members for a limited time. Most covenant groups close the “tent flap” seasonally in order to nurture trust within the circle and deep conversation and relationship among its members. As the sounds of our playing (read: screaming) children rose up through the floor, a group of us young couples opened up our hearts and shared about the difficulties of turning the other cheek, setting a good example, frustration with family members and in-laws, fear of failure in front of our kids, and more. One recurring theme emerged. Across the board and within all three dimensions of self, culture and nature — cultivating gratitude is hard work. At that moment, one (or more) of the kids started banging on a downstairs piano. The sound was jarring and discordant and came up through the floor in angular vibrations that momentarily put all of the parents on edge. It occurred to me that the children didn’t know how to play the piano, but they were doing the best they could to make music with it. They, too, were ignorant to the workings of the instrument and so they simply wailed away at it, hamfisted and dispassionate. They were being too rough and too forceful, not patient or gentle. This piano is a metaphor for our self-care. How often do we expect others to be maestros of communication, trust and compassion? How often do we expect others to be delicate, patient and gentle — to take their time, choose their words carefully, think before they speak or act, and to hold themselves with the utmost self-respect? And yet, how often, when it is our turn to do the same, do we bang out a rhythm or a half-baked melody and tell ourselves that it’s good enough. How often do we settle for less when it comes to finding pleasure or acceptance in ourselves? Self-love and self care is not just about mindfulness. It’s not just about carving the time out of your day to pray, meditate or be present with your friends, co-workers and kids. It’s about moving beyond mindfulness to the difficult work of being in the world and witness to all its suffering. It’s about having the courage to put yourself out there when someone needs emotional or spiritual support, but also having the courage and intelligence to receive that support yourself. Gratitude is also present in our attitude toward others. Stephen Prothero has consistently proposed that the world’s faith traditions are an attempt to solve a specific human problem with a specific spiritual solution (sin/salvation, attachment/awakening, pride/submission, exile/return, etc.). 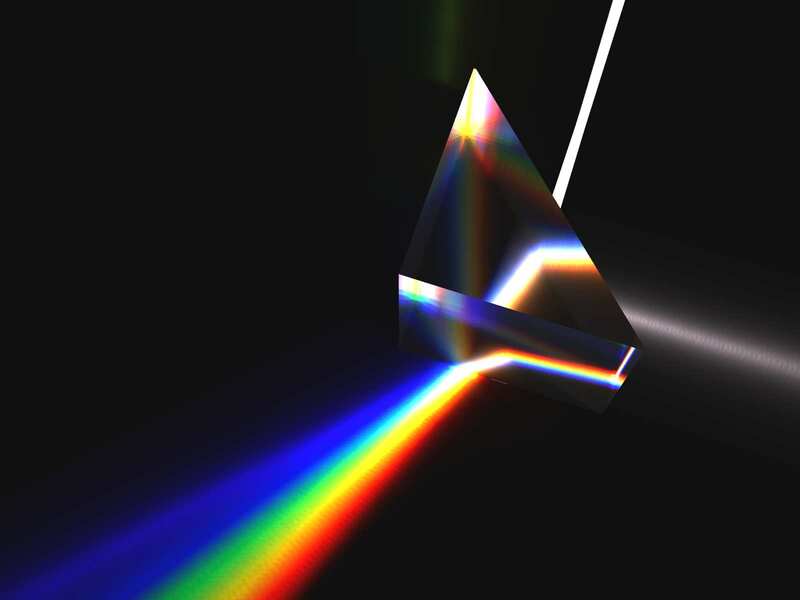 Since pride is usually near the top of any list of cardinal sins, it is usually one of the first items to attract the attention of rigorous spiritual practice. Gratitude can be seen as the opposite of pride. The process of becoming more grateful, more thankful and more humble is the process of letting go of our pridefulness, ego and will. 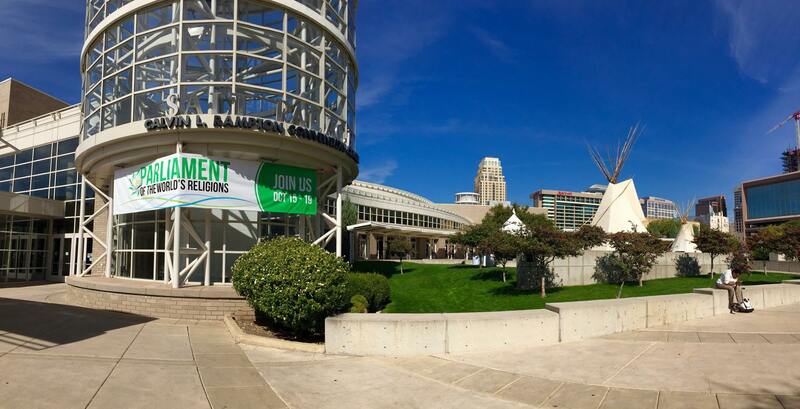 The Parliament of the World’s Religions was held on October 15-19, 2015 in Salt Lake City, UT. Roughly 10,000 people attended this year’s event, representing hundreds of nations and over 50 faith traditions. Attendees included academics engaged in roundtable talks of peace, disarmament, conflict resolution and climate change; leaders of various faith communities (Christian, Buddhist, Hindu, Muslim, Jewish, pagan, indigenous, interspiritual and more) committed to spreading peace and compassion in the world; as well as spiritual seekers and activists dedicated to healing their own communities from within and using interfaith dialogue to bridge some of those divides. Guest speakers and panelists included biologist Jane Goodall, author Karen Armstrong, activist Eboo Patel, New Thought minister Michael Bernard Beckwith, Sojourners founder Jim Wallis, and many more, including His Holiness the Dalai Lama, who fell ill at the last minute and had to return home. Several impromptu groups and coalitions were formed during and after many of the lively discussions and plenaries in order to leverage the momentum created at this historic event. 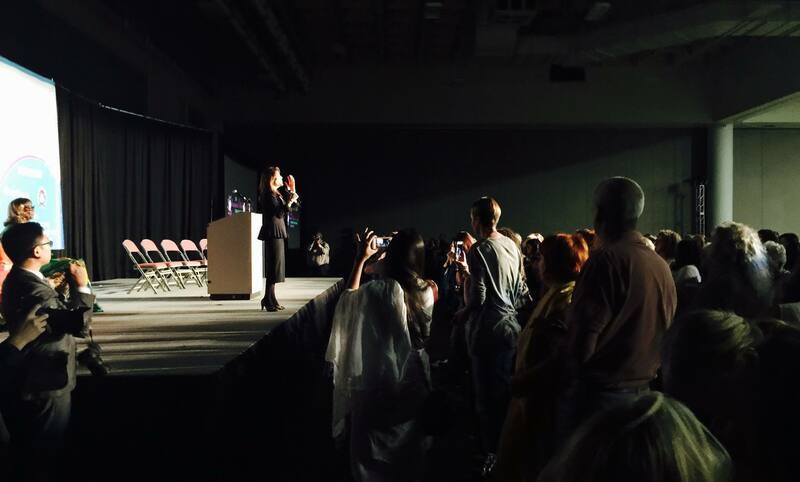 The halls of the Salt Palace Convention Center stayed active and alive all weekend long with talks of peace, interfaith harmony and global awakening. The theme of this year’s Parliament was “recovering the heart of humanity.” With the overwhelming (and refreshing) presence of the Inaugural Women’s Assembly, the focus on indigenous peoples, and the continued conversation around climate change, much of the event was spent turning social issues and recently-identified problems into concrete actions or takeaways. The Red Tent Movement (based on the popular book by Anita Diamant), was the sponsor of the Women’s Sacred Space. Men were welcome to enter the gauzy, red room (a meeting room modified to resemble the inside of a darkened, Persian tent and lovingly referred to as the “womb of the Parliament”), but when the doors would occasionally burst open releasing huge crowds back into the flow of the bustling hallways, most everyone I saw was female — and they were beaming. It was like a charging station for the female soul. The Red Tent. Photo by Giuliana Serena. Stories circulated about The Indigenous Grandmothers — a group of female elders from the various tribes present at the Parliament. If you were lucky enough to fall in with this group, you were treated to prayers, songs and dances from various faith traditions; entrusted into a circle of maternal power forged by language and culture; and part of a historic, once-in-a-lifetime gathering. As these languages and cultural practices shrink from the earth (some are simply gone forever), the Grandmothers seemed to plant what remaining seeds they had. 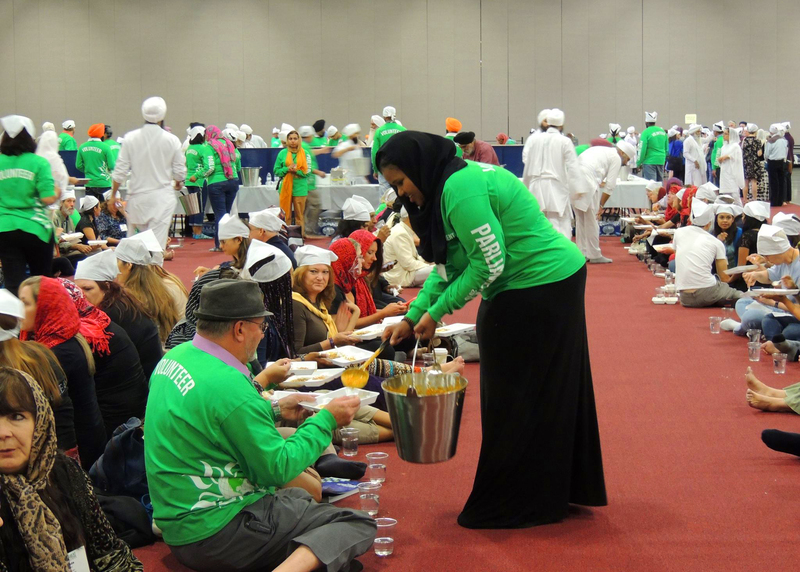 A traditional Langar (community meal that is shared regardless of faith or caste) was served every day to conference attendees by the Sikh community who donated all the food and volunteered their time each day to prepare, serve and clean up. The menu was a rotating blur of rice, lentils, curry, naan, yogurt, fruit, vegetables, coffee and chai tea. People lined up each day at noon (hair covered and shoes removed) to be seated on the floor in long rows and share a meal with strangers and newfound friends. Each day the line was longer, as word spread of the fragrant Basmati rice and spicy lentils. Truly one of the best meals I’ve had. After the event, nearly 1,000 lbs. of leftover food was donated to a local Catholic charity that served the homeless. Serving of the Langar. Photo by Carl Jylland-Halverson. Alas, not everything at the Parliament came up roses and rainbows. On Friday, the Council on Foreign Relations sponsored a luncheon at the Marriott which featured Farah Pandith and Graeme Wood (the journalist who wrote the recently-gone-viral article for The Atlantic, “What ISIS Really Wants”). The session was moderated by Lee Cullum. By the time the Q&A began, the attendees (who had already been fed) were restless. Some in the crowd weren’t satisfied with the positions taken by Pandith and Wood and became combative. Cullum pulled the plug on the session, ending it early. Former Catholic priest and iconoclastic author, the Rev. Dr. Matthew Fox, was on hand Friday to lead 300 or so lucky people in a Cosmic Mass. And those who had managed to squeeze into Ballroom H were treated to a transformative experience. The Cosmic Mass is typically held in Oakland, CA and resembles a Catholic mass but with a 21st century twist. It includes electronic music, video projection, and ecstatic dance as well as prayer, communion, and a grieving ritual which asks attendees to get on all fours and moan until they are emptied of their suffering. I had run into Fox’s assistant and director of The Cosmic Mass, Skylar Wilson, on Friday morning. I had offered my services, and was promptly given the job of puppeteering the Green Man during the Cosmic Mass event. The Green Man was a huge disembodied papier-mâché head on a pole, draped in green gauze and flanked by two large hands, also on poles. The figure required three people to operate. The Green Man was accompanied by a second puppet — the female figure, Gaia (Mother Earth). These two gigantic puppets (created by Mary Plaster) in their full splendor on the dance floor, represented the union of the sacred masculine and the divine feminine. Fox began the ceremony by providing a brief introduction to his Creation Spirituality movement. This teaching includes a belief in a spiritual connection to the earth, a replacement of the concept of “original sin” with “original blessing” and the four paths of the via positiva, via negativa, via creativa and via transformativa, which align with the cardinal directions of north, south, west and east. There was an invocation, a calling-in of the directions, music and drumming (including a standout vocal performance by Michelle Jordan), the grieving ritual, a reading of Neil Douglas-Klotz’s Prayer of the Cosmos, and the “passing of the peace” (in which attendees wandered the room, touched hands, and greeted each other with “namaste”). Then it was time for the dance. The Green Man and Gaia, powered by their six volunteers, took to the dance floor and swayed and pumped to the pulsating electronic rhythm until the event was over. Matthew Fox leading The Cosmic Mass. As a leader of spiritual community, The Cosmic Mass was a revelation. It was a religious experience like none other — connecting everyone in attendance directly to each other and to the Source of all. It held the elements of masculine and feminine power in exquisite balance and oriented us to the cycles of the season (not only in the world, but in our own hearts). It was joyous, heart-breaking, contemplative and awe-inspiring. It also is ceremony and ritual that proudly wears the clothing of 2015 (video, technology, social media). For those who are seeking a post-modern worship experience, one that as Fox likes to say is rooted not is “text” but in “context,” then the Cosmic Mass is that experience. It will keep me fed for the upcoming year (or until I can experience it again). Science and Religion: Can We Have Both, Please? Have you ever wondered: What is the current role of religion in our society? Does religion do more harm than good? What does the future of religion look like? Are churches, temples, mosques and religiously-affiliated nonprofits serving the greatest good of the community (or even the greatest number of common values of community members) with their programs and outreach? We depend on religious institutions to grapple with life’s big questions and to provide peace and counsel in times of pain and suffering. We rely on them to connect individuals, families, neighborhoods and communities not only physically through face-to-face experiences and in service to others, but also virtually online. Can we not also depend on them to evolve — to address the needs, values and beliefs of the world — to transcend and include? Religious communities convene people physically in rooms together, but let us foster connections between the interior dimensions of those same individuals, families, and neighborhoods. These connections are formed around common values and teachings and this shared, intersubjective space called “we” is where the seed of the greater good can be planted. Sometimes we are told that the teachings of science and religion contradict each other. But there are plenty of ways that science and religion might exist together, as two dimensions of our very complex reality. These subjects should be taught early and often as our ability to understand and our perception of the world changes over time. Certain amounts of doubt and skepticism to balance out our faith and wisdom can be healthy. Believing something (until we don’t anymore) is good for us — it keeps us flexible, responsive, engaged and alive. In Sanskrit, the word namaste means that there is a light (Spirit, consciousness) inside of me that is identical to the light inside of you. There have been empirical scientific discoveries that explain this connection (from mirror neurons to quantum entanglement). And we also know from watching episodes of Cosmos that the matter that comprises the universe is at the same time connected by — and cradled in — vast regions of invisible or “dark” matter. Dark matter is involved in both the attractive and gravitational force between celestial bodies (that which keeps our worlds in place) as well as the repulsive force between solar systems (that which keeps our universe expanding). It is that same ubiquitous, unifying, dynamic and regenerative force that some call “God.” (May that force be with us, always). We are still in the transition from modern to post-modern (hierarchy to holarchy, “text to context”), and we may have a tendency to rely too heavily on the advances and authority of science. We may feel we have outgrown the tribal and magical traditions of our ancestors through thousands of years of transcending and including. New stages always include those that have come before. Matthew Fox, the iconoclastic founder of the Creation Spirituality movement, once said, “we are not born onto this earth, but from it.” If we give ourselves permission to access and honor (even exalt) our tribal/magical roots, it may be through this process that we extend the much-needed consideration (not just behavioral change) to the ground from which we have come — showing our planet the same love and respect that we would show an elder. Our planet, our people and our future are badly in need of a spirituality that is not rooted in erecting boundaries and “either/or” thinking. Our spirituality should be one of “both/and” — a spirituality that radically includes the forms of masculine and feminine, inner and outer, individual and collective, faith and practice. There are many forces at work in the Cosmos, many opportunities for us to be over-stimulated or distracted, many different ways to express love. Our spirituality shouldn’t force us to choose sides against men, women or even love itself. Let us not assume “safe” ways of thinking. And let us never affirm that thought itself is dangerous. Exercising our intellect might even be part of our spiritual practice. We might even embody a spirituality that is both creative and self-critical — a spirituality that holds more than one belief at a time. and thousands of people made aware of this important event happening right here in our city. By all counts, the second annual Interfaith Week St. Petersburg was a huge success. On September 13-20, 2015, the community of St. Petersburg, FL celebrated many things — religious tolerance and respect, peaceful activism, deep listening, open communication, leading by example, the building of bridges between people and communities, the healing of deep-seated wounds and historical divides, the planting of new seeds for the future. In short, the week was an inspiring whirlwind of collaboration and connection that usually happens at conferences and symposiums in towns other than our own. This time, it happened in our own backyard. 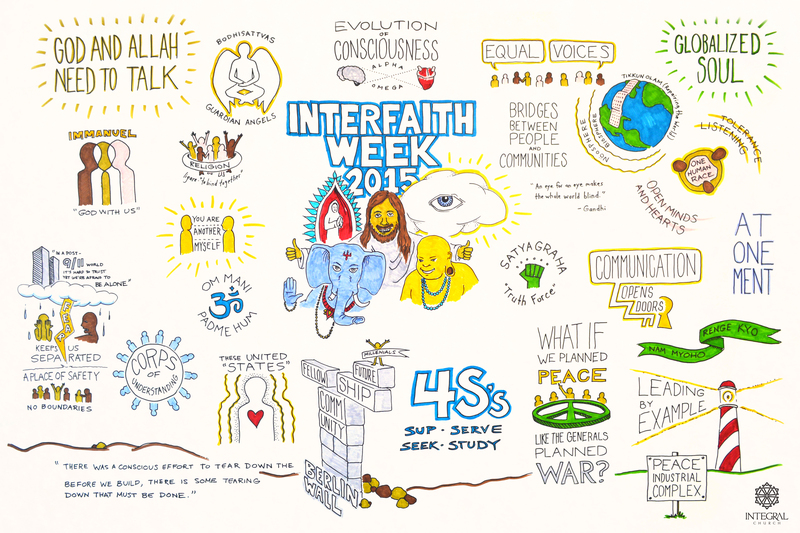 Thank you to everyone who participated in Interfaith Week on any and every level. It was truly an honor to be a part of such thought-provoking and mind- and heart-opening activity and dialogue. New friends were made, and we look forward to seeing what grows from the many seeds that were planted. Here are just a few of the people involved with the planning and production of the various workshops, panel and book discussions, performances, films and keynote presentations that made up this year’s second annual Interfaith Week event. Thanks also to this years sponsors and promotional partners: St. Petersburg Interfaith Association, Suncoast Institute of Noetic Sciences, The Bridge and The Connection Partners. If you’re interested in helping out next year, or getting more involved with interfaith activities in your area, please contact me. We’re always searching for warriors willing to wage peace and build a brighter future. Watch the mayoral proclamation of St. Pete Interfaith Week. Note: Some define “spiritual independents” as those who are unchurched or have left a mainline religious affiliation — like a third-way political party. For our purposes, “spiritual independence” means anyone who insists on critical thinking in religious matters. The graduates (and religion itself) were forever changed — their minds and hearts opened to a direct relationship with the Divine. The parents and faculty were angry and upset, and Emerson was banned from Harvard for over two decades. 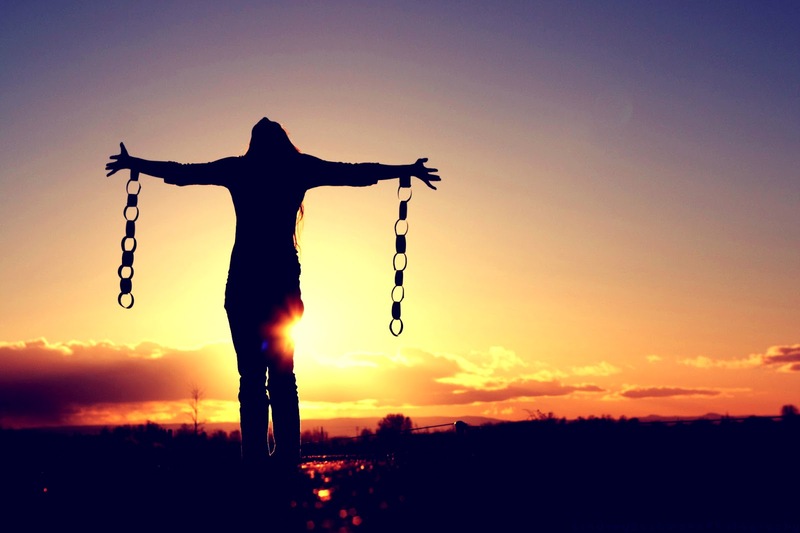 If we are to be truly free, we need to equip ourselves with the appropriate support on all levels and lines, and surround ourselves with the right types. We will need access to sound spiritual teachings, a free-standing system outside the mainline institutions, the right spiritual tools necessary to do the actual work, and the benefits of a rich community of practice.